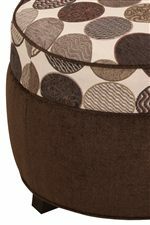 This casual oval ottoman makes the perfect accompaniment to rooms seeking accent without a huge increase in expenditure. Designed to bring style to casual rooms, this oval storage ottoman features quality craftsmanship from an American-made furniture manufacturer. A block foam cushion supplies the footrest seat, while an interior storage space allows homeowners to tuck away items they don't need out all the time. Complete with small wood feet, welt cord trim and nail head accents, this customizable upholstered living room ottoman will provide a casual comfort to any sitting space. The Olivia Oval Storage Ottoman for Living Room Footrest with Storage Space by England at Belfort Furniture in the Washington DC, Northern Virginia, Maryland and Fairfax VA area. Product availability may vary. Contact us for the most current availability on this product. Frame Construction Frame is made from 3/4? or 7/8? furniture grade plywood. Precision cut, fully interlocked frame with guide notches for accurate assembly. Perpendicular joints notched for increased overall frame strength. Frames reinforced with hardwood on stress points. Padding & Ergonomics Adjusta-Comfort ? seat cushions offer complete customization in all loose cushion styles. Cushion vents allow for foam ?recovery?, prolonging cushion life. Adjusta-Comfort? Cushion Inserts allow you to customize your seat to your choice of firmness. The Betty and Olivia furniture collections feature similar ottomans in unique oval shapes. A block foam cushion tops the footrests' seat while an interior storage space provides a casual convenience. Exposed wood feet, welt cord trim and a simple button tuft complete each piece, adding casual elegance for a simple home statement. The Olivia collection is a great option if you are looking for furniture in the Washington DC, Northern Virginia, Maryland and Fairfax VA area.